January isn’t exactly the most heart-warming of months; it’s cold, snowy, dark and full of post-festive blues. Still, there is one bright light shining amid the gloom, navigating us through the murk to cheerier shores – Burns’ Night. 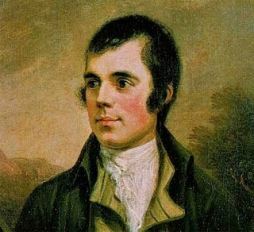 Every year, on the 25th of January, Scots the world over gather in celebration of our national poet, Robert Burns, and dinners are hosted from Moscow to Miami, Aberdeen to Auckland to honour this, our most prodigal of sons. Toasting the bard is more than enjoying clever poetry and pithy observation; it’s a once a year stare-in-the-mirror look at ourselves, our culture and our proud contribution. But, it also reflects that most Celtic of natures: a wry understanding that we don’t take that pride too seriously. Robert Burns was a genius, lets make no mistake; but he was not the first, nor will he be the last, but across the globe no-one sits down to celebrate a Mozart Dinner or a Shakespeare Evening, so it seems that Burns’ fame has a deeper reasoning. At heart he was a product of the Scottish Enlightenment – a beneficiary of the education system that walked hand in hand with the movement, a part of the Zeitgeist rather than a mover and shaker directly. From a young age it was clear he was clever: as his school friends often asked him to compose poems and ditties to impress the lassies they were after themselves. Not that Burns wasn’t fond of fair skin, and bumps in the right places himself. This may in itself answer part of the conundrum. Who, reading this, ever actually enjoyed poetry at school? What a lot of guff – teachers are apparently pre-determined to choose the most mind-numbingly boring poets possible for their students to study. Wordsworth – yawn! Keats – yawn! Shelly – yawn! And on it goes, but once you get to ladies-man, have a whisky, Burns then it all became a bit cool. The Scots, even teenage Scots, love their Gods to have feet of clay, and no-one has slippier feet than Burns; but no-one speaks their language better either. Here for the first time was a man who not only spoke in the vernacular of the people but understood their vices, and hated the hypocrisy of those who condemned it – no better shown than in Holy Willie’s Prayer one of his finest poems: even today, in Scotland hypocrites are known as Holy Willies. He was a man who ordinary hard working folk could identify with, and more importantly he could identify with them. From a personal point of view I think that Sir Walter Scott was more technically gifted than Burns, but he lacked the all important ingredient: the ability to connect beyond his own class and contemporaries. From Green grow the rashes o’ to the Selkirk Grace, and from A man’s a man to Tam o’ Shanter Burns displays a unique ability to pitch his wares to the audience at hand: from a farm bothy in Ayrshire to the fancy townhouse in Edinburgh. His understanding of the minutia of people’s lives and how they could be parodied sets him apart from among poets of his time; by being humorous and yet serious at the same time. While Wordsworth was wandering blithely after daffodils, Burns was contemplating our place in the world by the simple observation of a louse on a fine lady’s head – Wad some pow’r the gift tae gie us, to see ourselves as others see us – beat that for depth of thinking. So, we understand why he’s popular in Scotland: a man o’ pairts we all identify with, but how did it come to world-wide adoration and suppers? Burns’ poems had been published and were gaining fame at roughly the same time as Scotland started exporting her finest commodity – her people. Over the course of the 18th century Scotland exported hundreds of thousands to America, Canada, Australia, and across the British Empire; and where these people went they took Scotland with them. Five years after Burns death some of his friends including fellow freemasons, met on the 21st of January (the date of his death) to commemorate the life and times of their friend. They recited his poems, sang his songs and drank to his health. It was so successful that they agreed to meet again the following year, but on the 25th of January to celebrate his birth. This time there was a meal, formal toasts and recitals, and music: and the first Burns Supper was born. It was hugely popular and Burns’ Clubs and Societies appeared all over Scotland. The date became sacrosanct, becoming known as ‘Burns’ Night’. In 1815 Sir Walter Scott organised the first big formal event in Edinburgh, with James Hogg giving the immortal memory. The evening became ritual, formalised, and firmly ingrained into the national psyche. Outside Scotland, Oxford University’s Scottish students held their first formal Burns’ Supper in 1806; inIndia the first was held in 1812 and by 1844 both Australia and New Zealand were holding official government funded Burns’ Suppers. At the same time the Royal Family also got in on the act hosting their own versions, and thus stamping regal approval. The event continued to grow legs, gaining ever greater popularity among ex-pats and those of Scottish ancestry in the United States, Europe and beyond. Robert Burns’ had become the world’s greatest posthumous superstar – and arguably remains so. His famous song, Auld Lang Syne, cementing that immortality. The ceremony has hardly changed in over two centuries: The Immortal Memory, the toast to the lassies, the reply from the lassies, Tam o’ Shanter, the piping and recitation to the haggis, dancing and drinking. Done right, and lightly informal, it is the most magical night you can imagine. Who else, dead 200 years still gets that kind of ovation?